Haslemere is a unique and delightful Surrey town – now a property hot spot. The mix of the population is changing rapidly and the incoming well-paid commuters dominate the economics of life in Haslemere. Social and economic factors have combined to push up property prices to such an extent that many people who work in or around Haslemere, or would like to do so, cannot afford to buy or rent here. Worse for the future of the town, not many of the town’s younger generation can hope to have a flat or house of their own. Local businesses report that they are finding it hard to recruit and retain staff. Properties coming on to the market are frequently snapped up by well-paid incomers, and the local authority, Waverley Borough Council, lacks the means to make serious inroads into the housing problems faced by the less-affluent in the community. The idea of a community land trust for Haslemere was first proposed in 2013 at a meeting of Haslemere Vision (22nd October 2013). 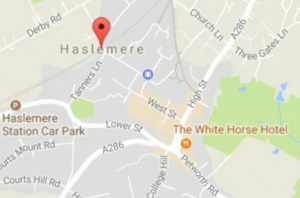 Haslemere Vision (HV) is a group set up in conjunction with Haslemere Town Council to prepare a Local Neighbourhood Plan. This plan was to be used by Waverley Borough Council to guide planning decisions for the town. Having noted a shortage of affordable housing and a reduction in employment in and around the town, it was concluded that high and ever-increasing domestic property prices were largely to blame. The possibility of forming a CLT was included in a community consultation exercise in 2015, and the idea received over 70% support from those responding. Consequently, an application was made to the National CLT Network for funding to hold a public meeting in June, 2016. Following presentations, the meeting concluded it was a proposal worth pursuing and several volunteers agreed to set up a steering group. The brief given to this team by HV was two fold: firstly, building permanently affordable housing for rent and covenanted purchase for members of the local community and those in key local jobs; and, secondly, encouraging affordable employment and business units to promote local jobs. Led by Stewart Brown, the chairman of HV, the steering group held its first meeting a month later and elected its chairman and secretary and agreed founding principles for the embryonic trust. Accepting HV’s brief as its foundation stone, the group concluded that affordable housing would be its primary focus, but resolved to widen its remit to include any communally beneficial activity where a gap exists between public or private provision and the aspirations of the community. Having been granted funding by the National CLT Network, the group is now certified by the Financial Conduct Authority to operate as a community benefit society, and is pleased to publish that. Haslemere CLT is now seeking further financial help to launch a membership drive and pay for relevant professional services. Potential projects have already been identified and work continues in attracting partners for new projects, finding further sources of funding and building the capability of the trust.